Figure 4.13 Quebec in 1700, its skyline punctuated by church spires. The key indicates the position of the Seminaire, the Jesuits, the Recollets, the cathedral, and the Hôtel-Dieu. Although the early French strategy in Canada was primarily economic, there was a cultural agenda as well. The French did try to Christianize some groups of Aboriginals, most notably the Wendat. In 1615, the first Recollets (a monastic order of the Catholic Church) arrived in New France to go out among the locals — particularly the Algonquin — to Christianize them. Evicted from the colony in 1629 by the English, the Recollets were replaced almost immediately by the missionaries from the Jesuit Order, also known as the Society of Jesus. Over the next 20 years, the Jesuits worked among the villages of the Wendat Confederacy in particular, learning their language and their culture. The Jesuit approach was distinct from that of most other missionary groups in that they did not try to Europeanize the Aboriginal people; that is, they did not attempt to change their socioeconomic culture into something resembling European styles of living before attempting to win their souls. Instead, the Jesuits sought common cultural elements that would help bridge belief systems. To be sure, as far as the Jesuits were concerned, this was a bridge that ran one way only — toward Christianity. The efforts to convert the Wendat were largely unsuccessful, with very few converts, perhaps fewer than 10 in 50 years. However, the Jesuit experience in Canada is significant as the missionaries wrote extensive reports back to their order in France, detailing the practices and beliefs of the Wendat. Much of the information we have about the Wendat and other groups in the Quebec area comes from these letters, collectively called the Jesuit Relations. The Wendat experience of this initiative is considered in Chapter 5. The modest success of the missionary efforts should not overshadow the larger Catholic agenda of the French empire in North America. Religious politics in Europe were divisive; national identity was, in many respects, secondary to sectarian identity. This was the context for the colonial project of New France: it began as a commercial enterprise sustained and managed by religious officials. Until 1663 the colony was in the hands of private commercial monopolies with imperial oversight in the hands of the king’s ministers — Cardinals Richelieu and Mazarin — both of whom were simultaneously high-ranking representatives of the Catholic Church. The Recollet, Jesuit, Sulpician, and Ursuline projects both before and after the royal administration were extensions of a Catholic Church agenda that sought a cultural colony as well as a settler colony. This could be seen in declining tolerance for Protestantism in New France. In 1685 Louis XIV revoked the Edict of Nantes (1598), which drew an end to many of the civic freedoms enjoyed by Protestants in France for nearly a century. Many fled the port cities for North America, though not for New France. As the Huguenots were leaving, the Recollets’ presence expanded in Canada (in 1670) and in Plaisance as well. There was to be more Catholicism, not less, in New France as it became more a mirror of the institutions and values of the imperial centre. This played out in interesting ways in Montreal. When Ville-Marie was established in 1642, it was as a religious centre, a role that was quickly eclipsed by the fur trade. After 1657 the Sulpicians came to play a key role in Montreal in particular, where they were missionaries to the settlers rather than Aboriginal people. The demarcation of Church responsibilities in the colony handed the Jesuits the missionary roles among the Aboriginals, leaving the Sulpicians with more material tasks. The clergy of the Seminary of Saint-Sulpice had a key administrative role more involved with municipal authority than the saving of souls. They had responsibility for the poor, physical infrastructure, schools, courts, cartography, and business, among other things. They were French, not Canadien, drawn from a well-educated and generally upper-class population; many, according to historian Louise Dechêne, “had large private fortunes.” Some were disappointed at the lack of opportunity to salvage Aboriginal souls, and some felt robbed of the prospect of martyrdom. The seminary itself didn’t engage much in education until the mid-18th century. The main task of the Sulpicians was managing their seigneurial properties, which were extensive. When we think of the Catholic Church in the colony in this period, then, it is a rather textured thing — a bureaucratic businesslike operation that played a day-to-day role in the health and welfare of the community, produced food and created jobs, policed behaviour (in particular, relations between the troops and the local population), and of course undertook spiritual tasks. 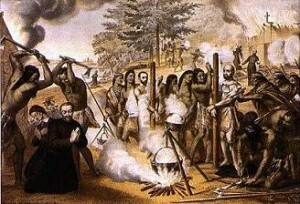 Figure 4.14 The martyrdom of Brebeuf, a Jesuit, at the hands of the Haudenosaunee in 1649. It was this kind of sacrifice that many of the colonial clergy sought for themselves. It would be a mistake to imagine the Catholic Church in New France as a monolithic structure. There was competition between the orders and there was little love lost between the Jesuits (loyal to Rome first and foremost) and the Sulpicians (whose origin and outlook was Parisian or Gallican). Nor were the colonists as deferential as one might expect when it came to the Church. The evidence strongly suggests that the Canadiens adopted a casual attitude toward the clergy, which could (and did) sometimes express itself as contempt. The Jesuits were frequently accused of interfering in the fur trade and commerce generally, which earned them a poor reputation with the coureurs de bois, voyageurs, and some merchants. The Sulpicians, for their part, had a reputation as moralistic busybodies. The fur trade wealth that accumulated in Montreal and Quebec was sometimes spent ostentatiously: by men on houses, horses, and fine suits, and by women on extravagant dresses. These expressions of prosperity attracted clerical condemnation, which was, of course, unwelcome. The fact that the clergy were overwhelmingly French in a sea of Canadiens paved the way for snobbery and prejudice that was mutual. And on the ground, in the individual parishes, it was often the case that there were simply too few priests and nuns to go around. Seigneuries without resident clerics were probably the norm rather than the exception. The habitants were expected to pay (through tithes and subscriptions) for a church building on their seigneury and sometimes a house for the priest as well. While there was some enthusiasm on the part of the habitants for the spiritual and civil services that a resident priest could provide, there was little enthusiasm for the costs entailed. In addition to tithes, the clergy regularly assessed charges for burials, provision of sacramental bread, and so on, and fines for a variety of offences associated with deviation from church-sanctioned practices. What the colonists clearly wanted was an ongoing relationship with a curé loyal to their parish, a chapel or church they could call their own, a role to play in the running of the parish (something else the clergy were reluctant to allow), and a place to focus social energies and receive the sacraments of marriage, baptism, and last rights. So long as Canada was a long string of underpopulated seigneuries and not a few concentrated settlements, it would be difficult to meet these expectations. The French regime introduced a Christianizing agenda during its first decade of colonial activity. Recollets and Jesuits had different approaches to Christianizing the Aboriginal peoples. The roles played by the Catholic Church were many and diverse. 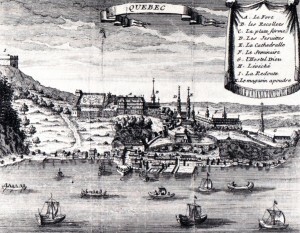 La ville de Québec en 1700 by Jeangagnon is used under a CC-BY-SA 2.5 license. Canadian martyrs 1649 by Jeangagnon is in the public domain. 4.7 Canada and Catholicism by John Douglas Belshaw is licensed under a Creative Commons Attribution 4.0 International License, except where otherwise noted.